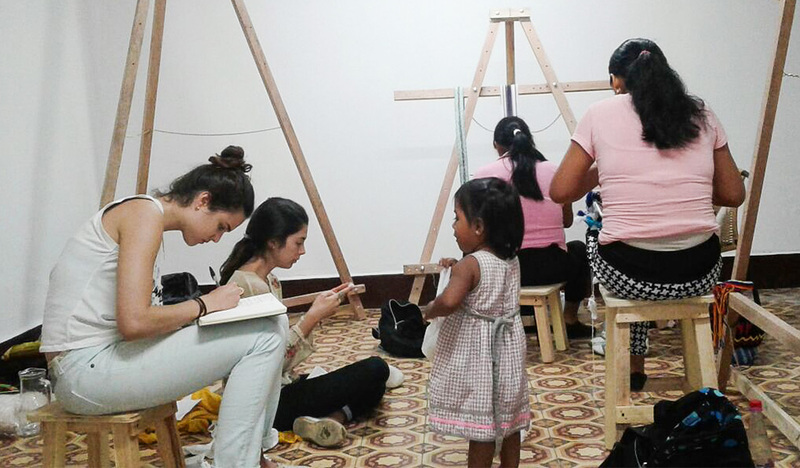 A few days after graduation, Savitri Restrepo Alvarez '16 returned to her native Colombia to work with indigenous women who have been displaced from their ancestral lands by the country's ongoing civil war. Restrepo Alvarez, an international relations and political science major, grew up in the city of Cali, where she saw firsthand how the ongoing conflict had affected the region’s Nasa people, one of Colombia’s largest indigenous groups. "Indigenous families often end up in large urban centers where they face severe difficulties in navigating an alien environment," Restrepo Alvarez said. "In particular, women tend to suffer disproportionately in situations where gender-based violence and misogynist practices are widespread." To help alleviate the suffering, Restrepo Alvarez developed the idea for Tejiendo Vidas—which means "weaving new lives"—to address the economic and social needs of Nasa women, many of whom work as domestic helpers. Her proposal recently won a grant from the Davis Projects for Peace, which awards up to $10,000 to 100 recipients each year to implement an initiative or entrepreneurial venture that focuses on conflict prevention, resolution, or reconciliation. Philanthropist and international scholar Kathryn Wasserman Davis '28 established the prize in 2007 to celebrate her 100th birthday. Tejiendo Vidas, housed on the first floor of a hostel in Cali, provides participants with the space and equipment—including yarn and looms—every weekday to make chumbes, traditional baby slings that are sold locally and will become available online. The project allows the women to express their heritage and creativity, encourage and support one another, and increase their income, Restrepo Alvarez said. Tejiendo Vidas also provides workshops every Saturday in a local community center, whose space was provided by the city's Secretary of Culture. There, experts and visiting guest speakers discuss subjects such as social integration, mental health and nutrition, and prenatal and postnatal care. Those workshops are supplemented with Spanish-language literacy classes and lectures on the legal and political rights of indigenous women. In the coming weeks, career counseling will also be available. "A strong Davis Projects for Peace proposal is always one that is grounded in a real knowledge of and investment in a community, providing a foundation that gives the student both inspiration and credibility as she strives to make real change," said Elizabeth Mandeville '04, director of exploration and experiential learning at Wellesley. "Savitri's project speaks to a social challenge that she knows well, drawing on her national roots, commitment to service, and academic pursuits. She brings integrity, compassion, and real energy to this initiative." Though the project is still in its infancy, it is already meeting crucial needs. "We provide two snacks and beverages on Saturdays for all attendees, and a lunch during the weekdays," said Restrepo Alvarez. "The project also pays for transportation to and from the center, and we offer a children's station, run by some volunteers of the project, that keeps the children busy and allows the women to enjoy the workshops." Implementing her Davis Project for Peace at home, "was the perfect culmination of my four-year experience at Wellesley, a place dedicated to educating women world leaders," Restrepo Alvarez said. "I have always felt a special call to extend Wellesley’s mission beyond campus by empowering women and girls all around the world." Lessons she learned from professors, mentors, and peers about embracing challenge, thinking critically, and being a problem solver have been crucial to her success with the project, which presents new challenges every day. Her experience as a 2016 Albright Fellow, and at the Clinton Foundation, where she worked last summer developing social enterprises, taught her how to solve problems creatively and collaboratively, and how to foster an inclusive environment, she said. The Saturday workshops welcome both Nasa women and low-income urban women, who have a chance to interact and learn together. Recently, the infant of an urban mother began crying during a workshop titled Coloring for Peace, a form of meditation inspired by the therapeutic art of coloring mandalas (a spiritual symbol that represents the universe). The embarrassed young mother did not know how to soothe her baby, so one of the indigenous women placed him in a chumbe and wrapped him around her back. "In a matter of seconds, the baby stopped crying and eventually fell asleep," said Restrepo Alvarez. "It was a beautiful moment filled with cultural exchange, trust, and a strong desire to share and learn from each other’s traditions and practices." Restrepo Alvarez said she is excited that the number of Nasa women who come to weave increases each week. "I am inspired and thankful to these hardworking women who want to leave behind their jobs as domestic helpers and do what they love to improve their living conditions and to build better inter-communal relationships in Cali," she said. "This, I believe, is what will ultimately bring peace to my city."